Become self-reliant for food supplies, Absolute Rights suggests learning to store seeds long term and ensuring a plentiful nutritional system. According to a recent Absolute Rights article, Americans across the country would benefit from learning how to store seeds long term, should the food supplies ever become depleted enough to threaten survival. Once people locate the best survival seeds for their emergency preparedness list, they will need to learn how to store seeds long term. Seeds will keep for a very long time when they are stored properly, said the article. The two main factors that cause seeds to go bad quickly are heat and dampness. When seeds are stored in a dry, cool place they can last for many years. The important thing to remember when storing seeds is that they must remain dry, with absolutely no contact to moisture. The article speculated that many people use the refrigerator. However, the problem with storing seeds in the refrigerator is they can be exposed to too much moisture. A fact that most people do not know is that moisture will eventually seep through plastic containers, and can even reach seeds stored in plastic buckets in the refrigerator or freezer. The best practice for saving seeds is to store them in glass jars, because the moisture cannot absorb through the glass, explained the article. Once the seeds are dry, they can be saved for many years, as long as they are not exposed to any air circulation. Aluminum packets are also used to keep moisture away from the seeds, said the article. Large seeds will keep for as long as 50 years, whereas smaller seeds like carrots, lettuce, and onions can only be stored for a couple of years. These seeds should be rotated and used to grow current crops, then be replaced with new seeds that are harvested from the current years’ crop. 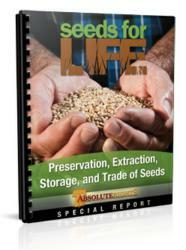 Absolute Rights has released a Special Report entitled “Seeds for Life: Preservation, Extraction, Storage, and Trade of Seeds” to help individuals become self-reliant food suppliers. It is easy to take responsibility of a personal food supply once people learn the rules of how to store seeds long term, said the article. For more information and a way to get a copy of the report, visit AbsoluteRights.com.